2007 Beta MINICROSS R 10. Picture credits - Beta. Submit more pictures. Everyday, all around the world, there are many kids trying to make their first experiences on a dirt-track, learning how to face a curve or enjoying their first exciting high jumps, dreaming of being an Off-road Star. But Beta Minicross is not only competition: beyond the will to win the most important thing is doing a sport to grow up with fun. Minicross is also a vehicle to improve safely the children�s concentration, balance and even consciousness and control of their own body. To start the young riders aged 4/7, Beta designed a vehicle with 10� wheels, moved by a little 50cc engine, single-speed, enough brisk and prompt for the first trips in the dirt-tracks. The drum brakes guarantee quick and good stopping, while the readiness of the fork and rear shock nullify the ground asperities: MX10 is safety and fun! Ask questions Join the 07 Beta MINICROSS R 10 discussion group or the general Beta discussion group. Bikez.biz has an efficient motorcycle classifieds. Ads are free. 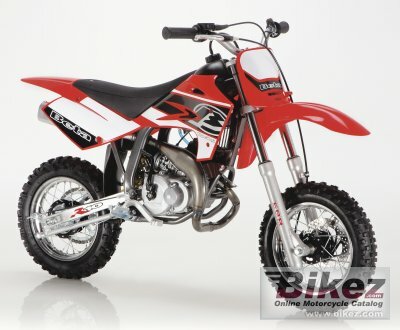 Click here to sell a used 2007 Beta MINICROSS R 10 or advertise any other MC for sale. You can list all 2007 Beta MINICROSS R 10 available and also sign up for e-mail notification when such mopeds are advertised in the future. Bikez has a high number of users looking for used bikes. Before you buy this bike, you should view the list of related motorbikes Compare technical specs. Look at photos. And check out the rating of the moped's engine performance, repair costs, etc.